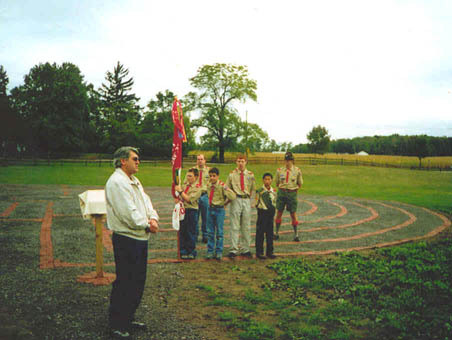 Many dedicated volunteers worked countless hours to construct this labyrinth. Using mostly shovels and wheelbarrows, workers moved 12 truckloads of stone to cover7,854 square feet at a depth of six inches. The labyrinth is almost 100 feet across and 314 feet around. The path is 1, 971.66 feet long. It contains 6,055 hand laid bricks. The center circular sandstone was proudly placed at the epicenter. It is engraved with the image of a loon swimming peacefully. The loon was chosen to be the center point of the labyrinth because it was Davids favorite bird. He enjoyed watching and listening to the loons while on his many camping trips in the Adirondacks and at Philmont.